The bride… the groom… and crazy aunt Zelma. Read about it all right here. If you thought “cowboy” and “chic” do not belong together in the same sentence, think again my friend! I’ll start you off by telling you my favorite line April used when describing her and Justin’s upcoming wedding to me. She said, “I’m thinking of this as more of a big barbeque, than a wedding”. After hearing that, I wasn’t quite sure what to expect from this wedding! As it turns out, I found that I (Breanna), really do love big barbeques that also happen to be weddings! ….and have way more line dancing than I ever knew existed…. ….but you also get the opportunity to actual enjoy your own day because you’re so relaxed and aren’t stressing about anything! 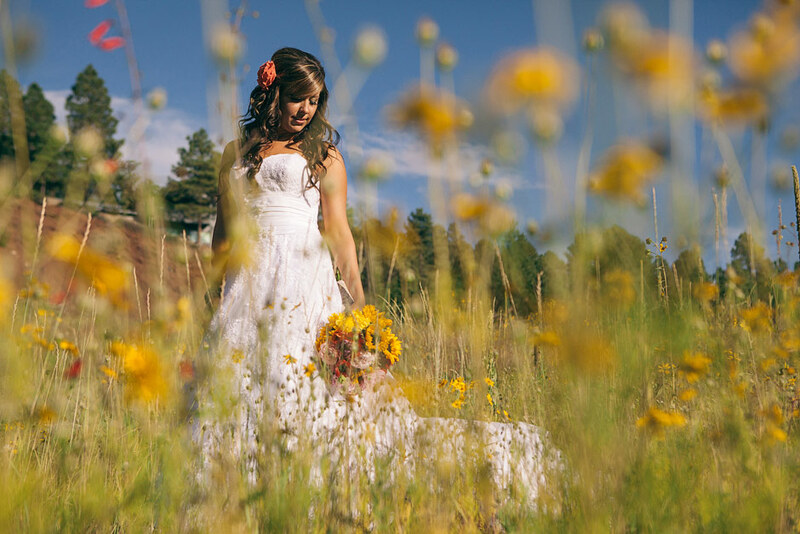 Even with all those great aspects of April and Justin’s wedding, my truly favorite part was that they chose to have it in the same little town that Scottie and I had our wedding at 8 years ago, Pinetop, Arizona! Pinteop is a place where it’s hard to have anything BUT a chill wedding, because it’s such a calm little town in the mountains. So I may be biased, but I think April and Justin chose the perfect place for their laid-back wedding/barbeque! There was zero and I mean, ZERO stress on April’s part. She was laughing and partying with the best of them instead of worrying about where each person was or where each decoration wasn’t. I really do think April and Justin found the key to a stress free wedding. And that key is called “cowboy chic”. Now, you’ll notice that I’m not just saying plain “cowboy”. I’ve added the chic in there for a good reason because this wedding wasn’t all manure and dusty wranglers… this was a wedding with some real chilled out class! It might have been viewed as a barbeque by the bride and groom, but it was still a wedding and they chose to treat it as such in all the right ways (pretty decor, a beautiful wedding dress, etc, etc), while ignoring some of the wrong ways (turning into bridezilla, being sleep deprived for months… or years.. before, etc, etc). So April and Justin, I have to say that I think you really have this whole wedding thing down! Which makes sense, considering April did plan weddings for a living in Colorado! Congratulations you two! We hope the rest of your marriage is as fun as the wedding day was! 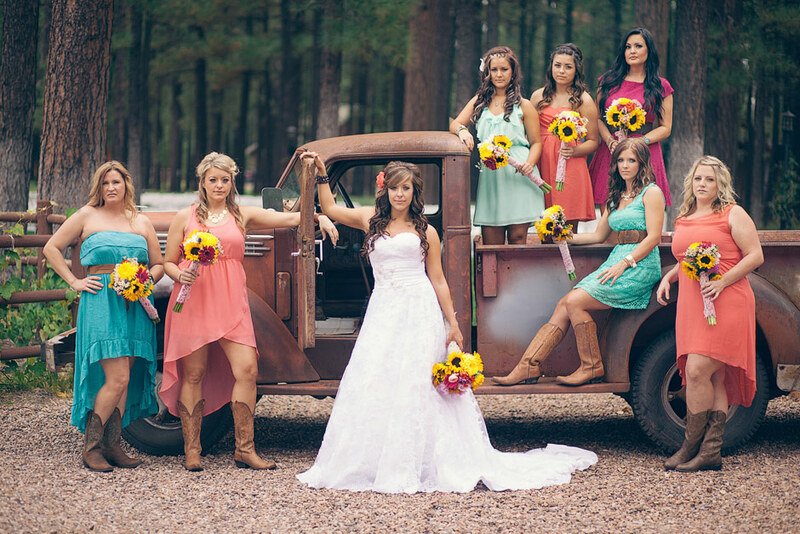 Click to see the rest of the photos from April and Justin’s Cowboy Chic wedding here. Do you believe in the perfect couple? If not, then you haven’t met Rachael and Aaron! Don’t believe me? Just ask anyone who knows them! I say that because just being at their wedding for one second would tell you that this was a true celebration! I’m not sure if I’ve ever seen a group of people more thrilled to be part of a couple’s union! It was obvious that this was a big day not just for Rachael and Aaron, but for all their loved ones who’d been waiting for this day right along side them. … followed by a gorgeous ceremony! After the ceremony, there was lots of love going around, a few photos being taken, and the general attitude of celebration was continuing! All of that led to finishing out the night with the kind of high energy reception that you’d expect from such a huge celebration! Emotions were high and tears of joy were flowing all day and night! And not just from the couple themselves, but from everyone around them! And I will have to admit that one of those joyful tears MIGHT have come from me (Breanna). You see, Rachael and Aaron’s friends and family weren’t the only ones celebrating, Scottie and myself (Breanna) were as well because her wedding wasn’t the first thing Rachael called us for… it all started with her senior pictures! Our pictures aren’t the only thing has changed over the years! Our girl is all grown up now and getting married! It’s so incredible for us to be a part of so many amazing moments in the history of a family (we took Rachael’s sister, Sarah’s senior photos as well!). Thank you to Rachael, Aaron, and family for choosing to include us once again in one of your beautiful family moments. It’s such a privilege and a joy for us! Plus, you guys throw a great party, so it was a bonus to get to be there for that as well! Congratulations Rachael and Aaron! We can’t wait to be there celebrating your future major moments in this new life you’re starting together! Click to see the rest of the photos from Rachael and Aaron’s celebrated wedding. Is there anything better than being a part of a wedding for a family member you love?! Well yes, there is one thing that’s even better than that and that’s watching a wonderful little girl get a new family. Amy and Anthony’s wedding contained both of those amazing aspects! Amy is my (Breanna’s) cousin and I’ve had the privileged of watching Amy grow up through the good and the bad in life, work so hard at being the best mom around, and struggle to find the perfect man to be a part of her and her daughter Tatum’s life. 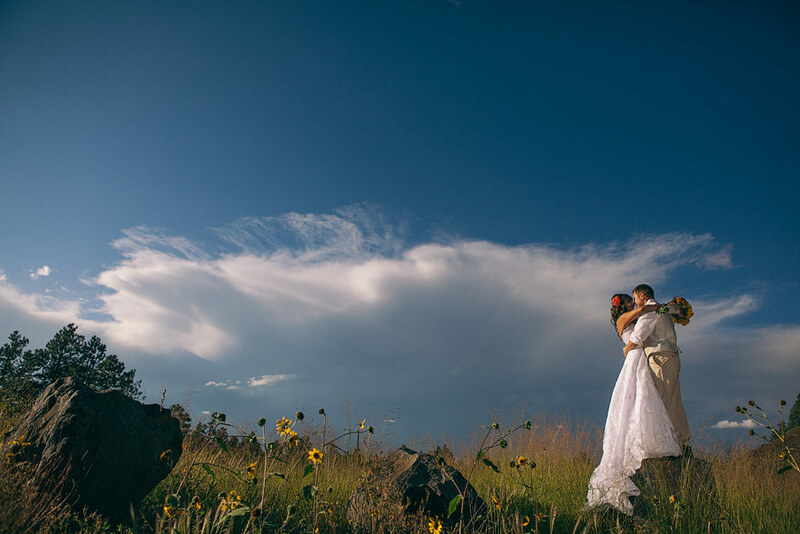 And I can tell you, it was more than exciting to see the results that came about once Amy and Anthony found one another and began the process of forming a family together as they prepared to head down the aisle to make it official at their Florence Windmill Winery wedding. I’ve been to A LOT of weddings at this point, but I have yet to see a wedding more emotional than this one was for every single person in attendance. People who are normally pretty even keeled emotionally… cried at this wedding. People who are not sure what they think about the institution of marriage…. cried at this wedding. The tons of people who always cry at weddings… cried at this wedding. Of course myself who has been a part of Amy and Tatum’s lives since they were both born… cried at this wedding. I think even Mr. Manly Man Scottie will even admit to shedding a tear or two! There was just no way of getting around the water works as you watched Tatum head up to the alter to join Amy and Anthony for a sand ceremony and family prayer. And just as you began recovering from the initial tear flow, the reception started and Tatum got on the microphone for her speech congratulating Amy and Anthony… and the tears started all over again. Then right when you’d finally fixed all your smudged eye makeup after the speech, Tatum and Anthony got up for their “new father daughter dance” right after Amy and her dad had their dance… and the tears started all over again! Of course, these weren’t sad tears running down all of our faces, they were tears that were moved by joy. And as the night went on, the joy spilled over more and more as it moved from our tear ducts to our dancing feet. It couldn’t be contained. This was one group of crazy happy people! And Scottie and myself were so happy to be right in the mix of it all. Amy and Anthony, it was such an honor to be not just family members at your wedding, but to be involved in capturing all your memories as well. Thanks for trusting us with such an important task, it means the world to us. Congratulations again on your wedding, we can’t wait to see where the 3 of you go from here! Click to see the rest of the photos from Amy and Anthony’s Wedding here.